The search for printing plates is over! Well, at least for Leaf hockey collectors. 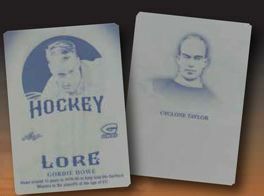 With the debut release of 2016 Leaf Plates Hockey, fans will be able to find the elusive printing plates from recent releases. Each box contains five, one-of-one printing plates. 2016 Leaf Plates Hockey offers authentic printing plates that were used to create some of the most coveted hockey cards in recent seasons. While In The Game Used is the only set specifically named on the sell sheet, the mock-up images also help guide collectors to what they might be able to pull. It should be noted that under 100 cases will be produced, making this one of the more limited Leaf hockey products of the year. Plates from 2015-16 ITG Heroes and Prospects set include Complete Jersey Prospect or Complete Jersey Hero and Hero Eight Jersey/Patch. 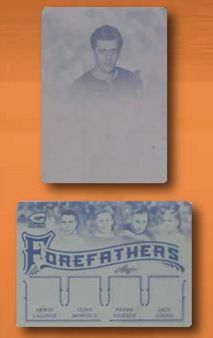 Also included from the latest ITG Game Used product are the printing plates from Legends of Chicago Stadium, which were the basis for cards that contain pieces from the beloved hockey arena. Among other brands, Genesis is well represented with the inclusion of Forefathers, Hockey Lore, and Record Breakers from the 2016 release. 2016 Leaf Plates Hockey also adds a signed 8x10 photo for Connor McDavid as a case topper. The total production of the release is limited to 90 cases. Check back as more information is revealed for 2016 Leaf Plates Hockey. This will top the worst junk ever produced. Nobody cares about printing plates. if only they took the printing plates completely out of all their other products and dumped them all here — then still nobody would buy this and they would get the message to stop trying to put plates in ANY product. gave it one star..b-cuz there is no NEGATIVE option and zero would mean they think I forgot to give a rating. Real rating is MINUS MINUS MINUS infinity stars.